Rugby Borough welcomed Desford to Kilsby lane on a very cold Saturday afternoon. Borough started well with plenty of possession and went close with a header just wide of the goal. Peerless then tested the Desford keeper from distance with a powerful shot. 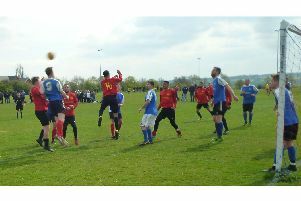 Desford thought they had taken the lead only for the goal to be ruled out for a foul on Borough keeper Biddle. The league leaders went straight back on the attack and Adam Shaw volleyed home Jamie Paye’s cross but their celebrations were cut short as the linesman’s flag was raised for offside. Alex Baird then fired over as Borough looked to break the deadlock before half time. The second half started with Borough again having most of the possession and went close again when Shaw superbly controlled Tom Glasscoe’s pass and curled a shot just wide. Borough’s patience was finally rewarded when Ollie Chater’s sublime volley from just outside the box found the top corner. Borough wrapped the game up when Chater curled home a free kick from the corner of the 18-yard box into the far bottom corner. The win sees Borough on 54 points at the top of the table, seven ahead of Saffron Dynamo on 47, with Thurnby Rangers and FC GNG chasing on 45. Man of the match: Ollie Chater. Borough team: 1 B Biddle, 2 J Taplin, 3 J Taylor, 4 N Whittam, 5 A Baird, 6 T Glasscoe (C), 7 A Shaw, 8 S Beasley, 9 J Paye, 10 L Peerless, 11 O Chater. Subs: 12 B Oddy, 14 H Matarutse, 15 L Pritchard.